Hola a todos! This Week in Review is quite long, but I assure you it is full of resources and knowledge that needs to be shared. — Lee & Low’s blog, The Open Book, shared a post on “Books as Bricks: Building a Diverse Classroom Library and Beyond,” which offers a list of recommendations for teachers looking to diversify their class and school libraries. — The blog, Reading While White, shared a guest post with one of our favorite authors, Yuyi Morales, who discusses “Day of the Dead, Ghosts, and the Work We Do as Writers and Artists.” Morales offers a beautiful discussion of her personal practices related to Día de los Muertos and the implications of its distortion in the general media and children’s books. “Telling Poor, Smart Kids That All It Takes Is Hard Work to Be as Successful as Their Wealthy Peers is a Blatant Lie,” which explores how these students face systemic disadvantages even though they work hard. – Lee & Low Books just released Rainbow Weaver/Tejedora del arcoíris. The story is about a Mayan young girl named Ixchel and her quest to create a beautiful weaving from unusual materials. — Lastly, Teaching Tolerance shared What We’re Reading This Week: November 4, a list of resources for critical and conscientious teaching in middle and high school classrooms. Image: Street Art. Reprinted from Flickr user ARNAUD_Z_VOYAGE under CC©. Saludos todos! As we continue our October themes of death, grief and loss, this week I will be reviewing The Spirit of Tío Fernando, a Day of the Dead Story/ El espíritu de tío Fernando, Una historia del Día de los Muertos, written by Janice Levy, illustrated by Morella Fuenmayor, and translated into Spanish by Teresa Mlawer. Although this year we’ve tried to expand our October themes to focus on the general concept of death, and not just as it relates to specific holidays, I felt it appropriate to feature at least one book on Day of the Dead. Since Day of the Dead is a celebration and cultural ritual that we’ve worked on extensively here on the blog, we wanted to expand our themes a bit this year; however, there is a reason that we’ve worked so extensively on Day of the Dead, and I find it nearly impossible to talk about the concept of death in Latin America without mentioning this beautiful holiday. Moreover, this particular story does a nice job of exposing readers to the various elements and practices of the holiday as it is celebrated in Mexico, while centering primarily on the young, male protagonist’s experience with death and grief. It’s that time of year! This week I’ve compiled a list of some of our favorite Día de los Muertos books, from which students can learn more deeply about the holiday’s traditions and history. The Día de los Muertos fiesta is a time for honoring and remembering. It is a time for celebrating family, ancestors, history, and loved ones who have passed away. It is mainly celebrated in Mexico, Guatemala and the United States, fusing Native Mesoamerican traditions with Spanish traditions. On our site, you can click on our Día de los Muertos tab under “Our Most Popular Themes” to see our many posts about Day of the Dead. Just this week Charla posted a video that teaches the meaning behind Día de los Muertos, and Katrina posted about Pictorial Input Charts for teaching about it in the classroom. Furthermore, we have a Halloween and Día de los Muertos Roundup of Books that is worth checking out. I hope you enjoy this month’s Reading Roundup, and that it helps with the teaching of this exciting holiday! This week’s post will wrap up my En la Clase posts on Día de los Muertos. The activities I’ll talk about today are great ones for the end of a unit, especially the Cooperative Sentence Strip Paragraph. 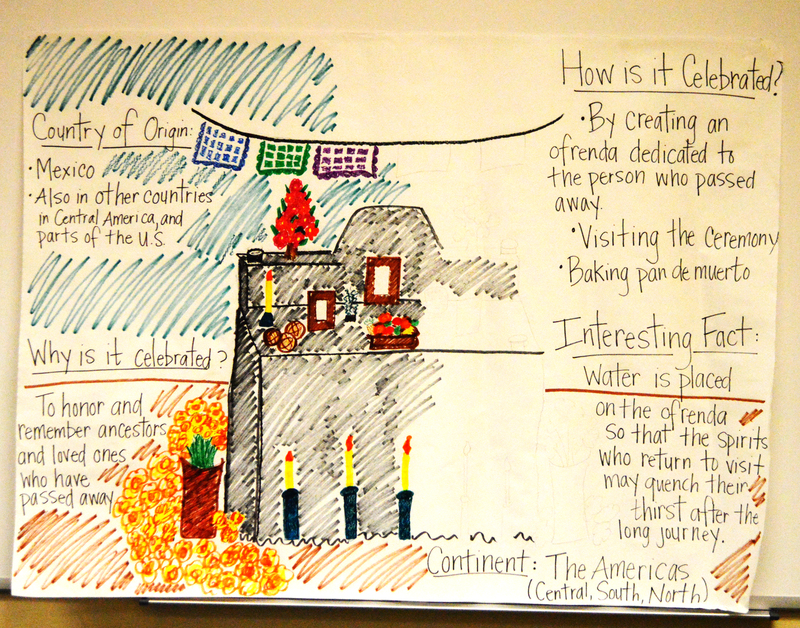 Just in time, our complementary guide with ELL and GLAD strategies for teaching about Día de los Muertos is now available online (just scroll down to the end of the activities, they’re right below our art activities). We’ve gotten great feedback from teachers about the materials, so be sure to check them out. Before we start talking about today’s activities, I want to make sure you saw Charla’s WWW post from Friday. She highlights one of my favorite animated short films about Día de los Muertos. It’s really beautiful. It communicates so much in such a short amount of time and without a single word of dialogue! It’s perfect for classroom use. Today I’m sharing another GLAD ( Guided Language Acquisition Design) inspired strategy for teaching about Día de los Muertos. But first, if you missed Alice’s post on Monday, be sure to check out her review of Uncle Monarch and the Day of the Dead. It’s a really interesting book about Día de los Muertos and the the migration of monarch butterflies in Mexico–quite unique in terms of children’s literature about the celebration. Saludos, everyone! As I shared last week, we’ve drawn upon Día de los Muertos happening at the end of this month as an opportunity to reflect on the loss of loved ones. 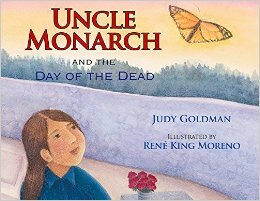 In accordance with that, this week I will be reviewing Uncle Monarch and the Day of the Dead, written by Judy Goldman and illustrated by René King Moreno. This book is best for grades 1-5, and will teach readers a valuable lesson on love and loss, while they journey through the seasonal traditions of a small, Mexican village. Uncle Monarch and the Day of the Dead is written entirely in English, though it is rich in Mexican cultural heritage, focusing as it does on the traditions of Día de los Muertos. At the back of the book, for instance, Goldman includes a list of Spanish terms and their definitions, including mole, “a rich, dark sauce made with, among other things, peanuts, chilies, tomatoes, and chocolate”, and cempazuchitl, “a type of marigold”, usually used to decorate altars for the dead. 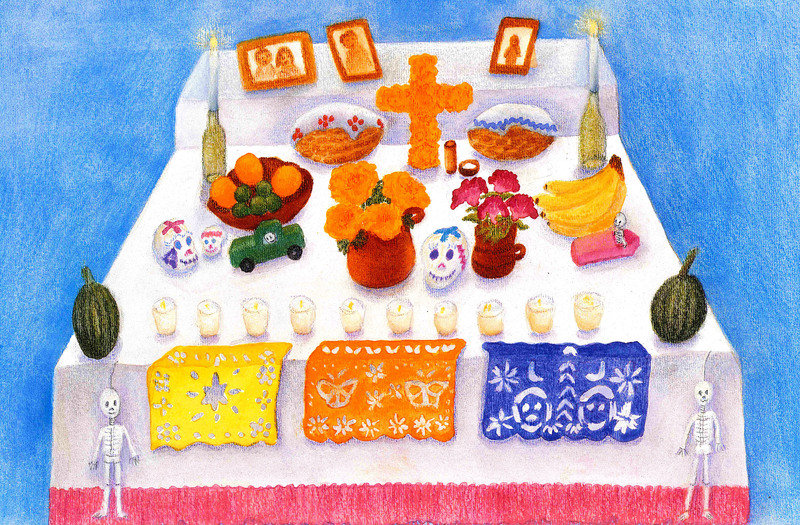 She also includes a page explaining the cultural significance of this Mexican holiday: “Many Mexicans believe that the souls of those who have died return on those days, and they are lovingly remembered by family and friends… Día de muertos is a time of fun, remembrance, and love.” This book is not only a great resource for teaching children about significant cultural traditions, but also for explaining the reality of death in a gentle and comforting way. 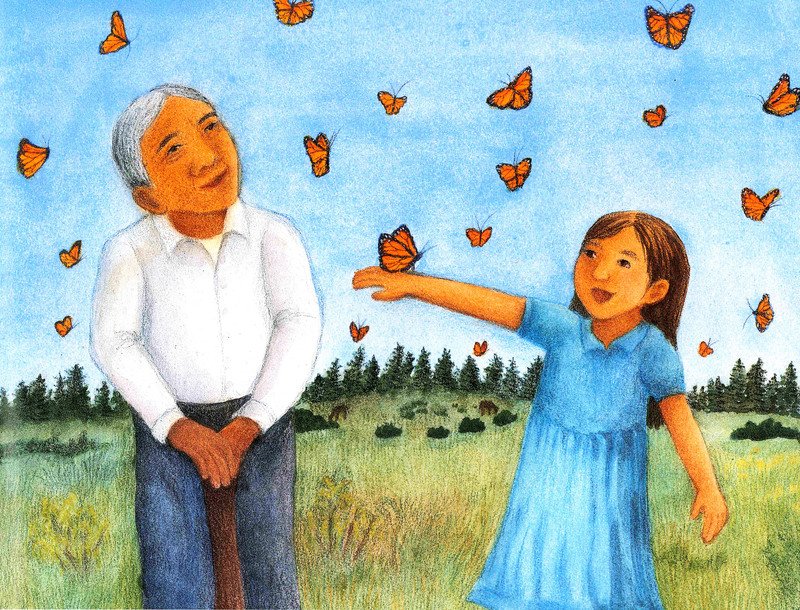 The story starts with a little girl, Lupita, running to her elderly uncle, Tío Urbano, to tell him that the monarch butterflies have arrived for the season. Lupita and Tío Urbano exit the house to admire the marvelous monarchs, and bask in the bitter-sweet memories that they bring each fall. Tío Urbano reminds Lupita of the familiar admonition that you must never capture or hurt a monarch butterfly, “for they are the souls of the dead ones, who have come back to visit us before Día de Muertos.” Tío Urbano explains to Lupita why Día de Muertos should not be a sad day, but rather a day to remember loved ones who’ve passed, and the good times spent with them: “Never be afraid of the dead, for those who loved us can never hurt us. We will always miss them, and this is why it is a blessing to receive the butterflies before Día de Muertos, when we show our dead that they are treasured and not forgotten.” Lupita and Tío Urbano spend a moment together fixated on the mesmerizing, undulating swarm of orange and black, remembering their loved ones who are no longer with them. The illust rations, done with soft colored pencils, complement the story’s soothing tone. My favorite image is one of Lupita and Tío Urbano staring up at the canopies of coniferous trees, with hundreds of butterflies flying through the shady maze. The forest resembles the pine-oak forests in Mexico, where a biosphere reserve was created to protect this transient species. The monarch butterflies migrate from North America down to these Mexican forests during the colder months, and then back to the US when it warms again. They are the only known butterfly to make a two-part migration the way that birds do. According to Annenberg Learner, “People in the region have noticed the arrival of monarchs since pre-Hispanic times.” This symbol has long been a part of Mexican culture and tradition. People all over the country associate the monarch butterflies with Día de los Muertos. In recognizing the monarch butterflies as reincarnations of the dead, and emphasizing the sacredness of these butterflies, this story also speaks to the importance of respecting and preserving nature and its habitats: “Lupita nodded and said, ‘I must never capture or hurt a monarch’.” The monarch butterflies’ seasonal habitat is currently threatened by climate change, as the increase in winter precipitation risks freezing the butterflies’ wings while they lay dormant. By teaching Lupita about the different ways of honoring loved ones, Tío Urbano also instructs her on a similar respect due to the environment. Once Lupita and Tío Urbano enter the house, Lupita starts helping her parents prepare for the festivities of Día de Muertos, while her uncle sits and rests. As she does so, the reader learns about the different traditions that accompany this holiday, such as putting up an altar to commemorate the dead with family photos, candles, and sugar statues of skulls, and making food that they “liked in life, and would now enjoy in spirit.” Lupita and her parents set up an arch of cempazuchtil flowers and string rows of colorful papel picado from one end of the living room to the other. Lupita also uses the cempazuchtil flowers to make a path of petals leading up to the house to guide the dead (the strong scent of the flowers is said to guide the spirits home). As Lupita dedicates herself to welcoming the deceased back into the lives of the living, she learns a great deal about the meaning of the holiday. This proves to be an invaluable lesson later on, when she is confronted with the death of a loved one for the first time. I loved this book, and I think it does an excellent job of radiating peace, tranquility, and comfort. This is a perfect book for any child who wants to learn about Mexican traditions or who is struggling with the loss of a loved one. Visit the LAII’s website to view and download our complete thematic guide for teaching about Día de los Muertos. Also, don’t forget to check out Charla’s post on the Monarch butterfly migration! Stay tuned for more great books!